Paleontologists made the discovery by combing through the museum’s massive collection of 143 million specimens. 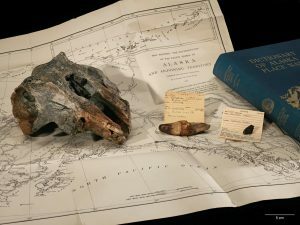 They stumbled upon a 9-inch dolphin skull, part of the collection since 1951, which might shed light the evolutionary ties between whales and dolphins. The fossil belonged to a dolphin that swam in Antarctic waters nearly 25 million years ago, according to Nicholas Pyenson, the museum’s curator of fossil marine mammals, and one of his researchers, Alexandra Boersma. The skull represents a new genus and species, which Pyenson and Boersma have named Arktocara yakataga. A digital 3-dimensional model of the Arktocara yakataga fossil described by Pyenson and Boersma. Click and drag to manipulate the digital fossil. Model by Smithsonian X 3D. By comparing the skull to other known species, the team concluded that the new species is related to South Asian river dolphins — the sole surviving species of a once large and diverse group. 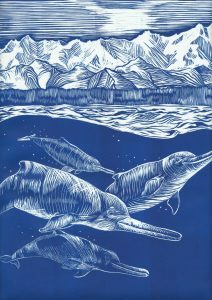 “Considering the only living dolphin in this group is restricted to freshwater systems in Southeast Asia, to find a relative all the way up in Alaska 25 million years ago is mind-boggling,” Boersma said. An artistic rendering of an ‘Arktocara yakataga’ pod during the Oligocene, about 25 million years ago. Art by Alexandra Boersma. The South Asian river dolphin is unique in that it swims on its side, cannot see and uses echolocation to navigate murky waters in its native India, Bangladesh and Pakistan. The dolphin lives in freshwater, and in recent decades, its populations have dwindled due to human activity, including fishing nets, pollution and habitat destruction. Pyenson and Boersma intend to use their discovery to explore the long lineage of dolphins as well as the evolutionary patterns of baleen and toothed whales. Pyenson hopes this discovery will support efforts to protect South Asian river dolphin habitats and the mammal’s evolutionary heritage.